GCE DEL Voices » Blog Archive » GM What are the effects of CO2 on the environment? GM What are the effects of CO2 on the environment? In pollution, the third unit of the Fuel course, the assignment was to write a research paper on the benefits and drawbacks of a pollutant. In the process of writing my paper, I learned several components that constitute a good scientific paper. It is organized by various subheadings such as the introduction, body paragraphs, and conclusion, which help the reader to follow the content better. It is very helpful for the reader to have a visual representation of a concept. One must adhere to the guidelines that the teacher has provided for the research paper. It is crucial that they fulfill every guideline so points are not deducted from their work. 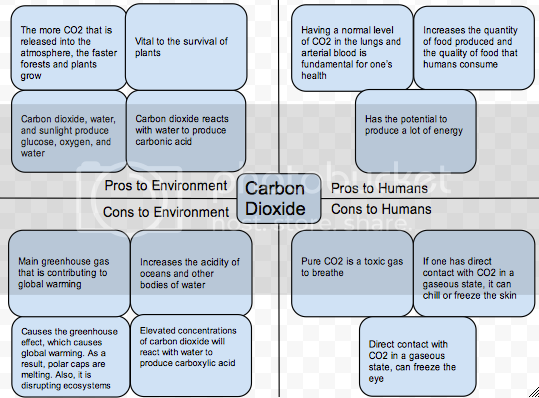 I found it quite helpful to write out the pros and cons of carbon dioxide on a concept map. I made logical connections between the information that I gathered. I then categorized this information into how it impacts humans and the environment negatively and positively. This map helped me to narrow down the focus of my research paper to the effects that carbon dioxide has on the environment. The unit has inspired me to take steps toward reducing my carbon footprint. The biggest step that I can take toward being eco-friendly is by conserving the amount of energy that I use. I need to take fewer plane flights, because they emit a lot of CO2 directly into the atmosphere. I should avoid planes and vehicles as much as I can. Instead, I should walk or bike to my destinations whenever it is possible. I need to turn off my air conditioning and/or heater when I am not in the house. Human activities have greatly contributed to elevated levels of carbon dioxide in the atmosphere. We need to learn to be better stewards of this earth if we want it to sustain human life for many years to come. You can click below to view my research paper.